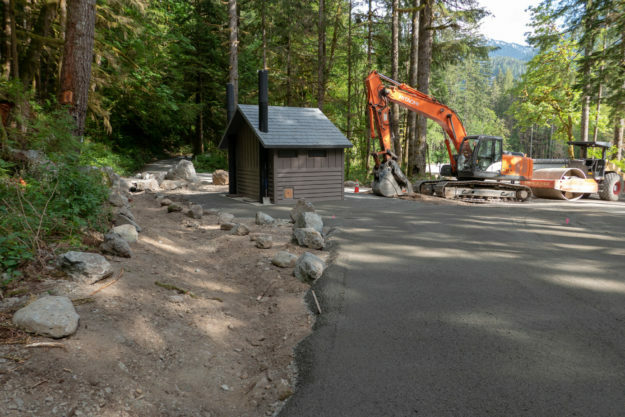 Five years after filing a plan to build a trailhead at the Dingford junction just past the Taylor River bridge the Forest Service began work on the new Garfield Ledges trailhead. It includes a two vault toilet, 4 parking pullouts, and eventually 14 picnic tables. 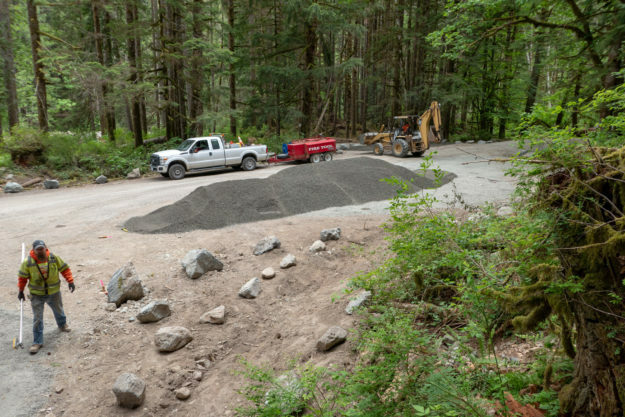 This new trailhead also solves a problem that began in November 2015 when a series of floods washed out the 1/4 mile spur road to the Taylor trailhead leaving few parking spots for the popular hike to Lipsy Lake and Otter Falls. 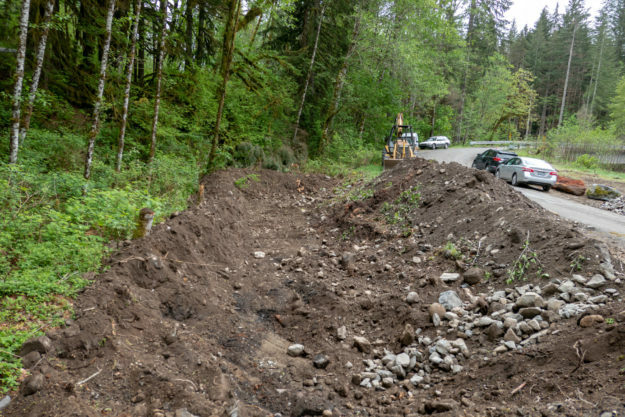 The washouts were too deep for most vehicles to drive through and eventually the road was blocked by barriers in November 2017 and continues to be. But at least there are plenty of parking spots now for all but the busiest weekends. 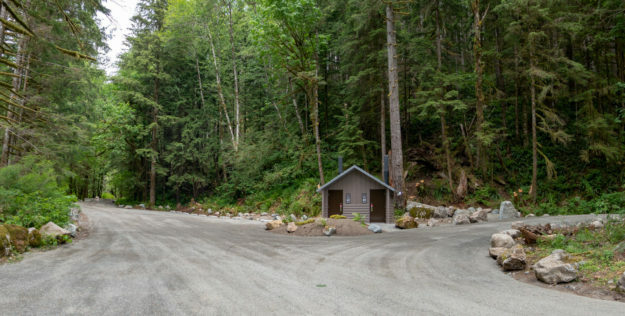 In the past this area just beyond the bridge was a very popular camping area with four dispersed camp sites along the Taylor river. 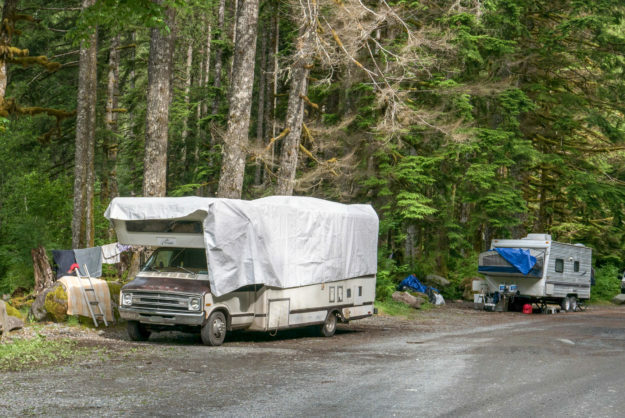 Last summer a couple parties parked their RVs next to the sites and used them for at least the maximum 14 day stat. 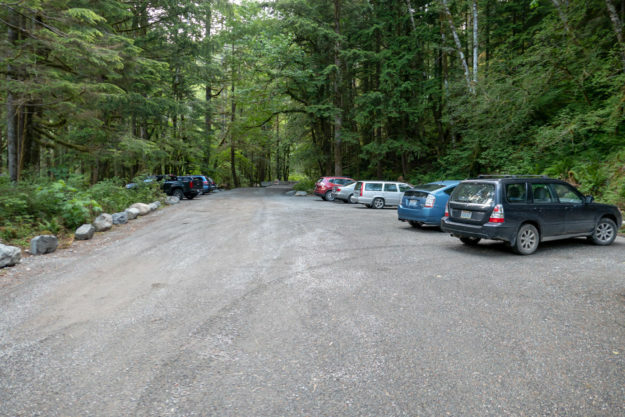 All of the sites have been converted to day use areas with picnic tables and it may come as a surprise when people drive up to use their traditional site and find out that camping is no longer allowed here. 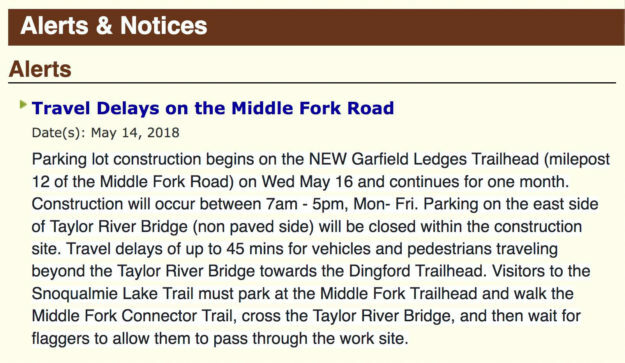 Simultaneously with the trailhead going in work resumed on the Garfield Ledges trail which starts to climb right behind the bathroom. 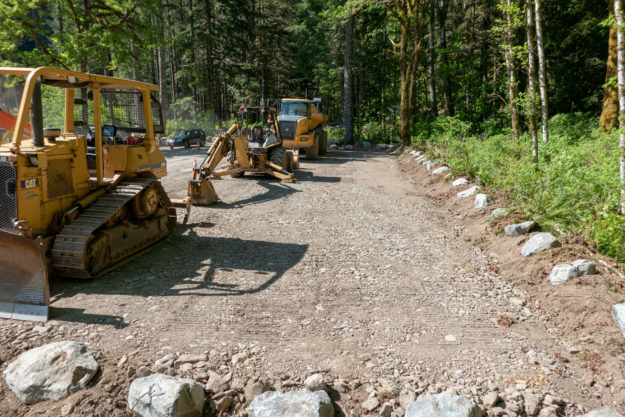 Last year the last third of the trail was built by hand and now an excavator is being used to slowly carve out the trail beginning at the bottom. 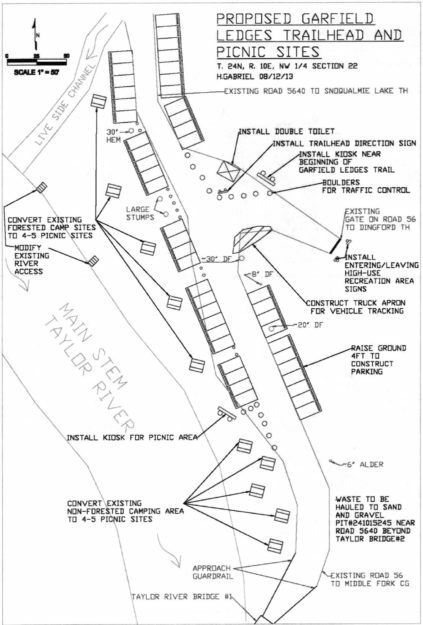 Early plans for the Garfield Ledges trailhead from the September 30, 2013 SOPA document for the Middle Fork Recreation Hub Project. It took 5 years for this to become a reality. Dingford junction in December, 2017 before work began. 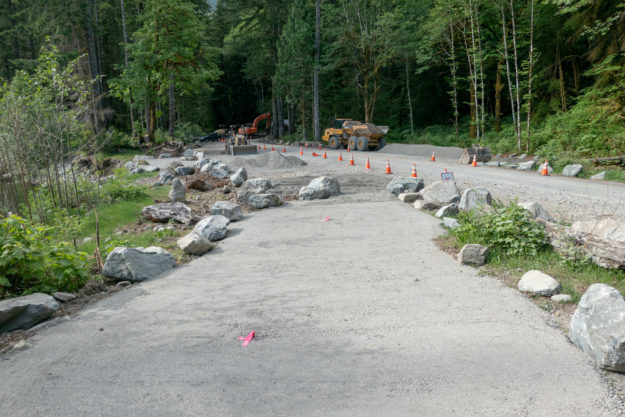 The jersey barriers blocking the spur road to the Taylor River trailhead were installed in November, 2017. The USFS published an alert on their website about travel delays on May 14, 2018. Work began and May 16 and as promised was completed within about a month except for installation of the picnic tables. 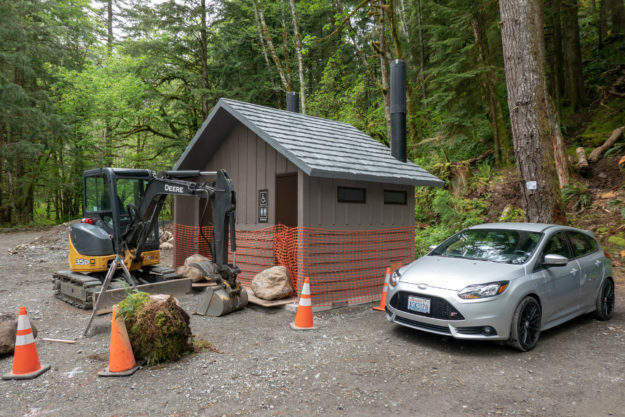 Work began in mid-May, 2018 with the first big change being the addition of a new two-stall bathroom. New bathroom with big rocks blocking doors to prevent early access! 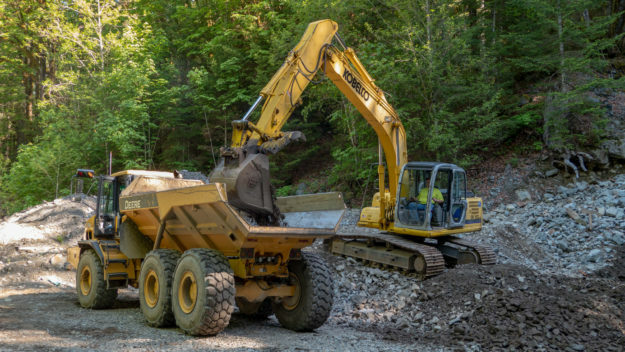 Creating a new parking pullout begins by digging a pit and filling it with gravel to ensure good drainage. 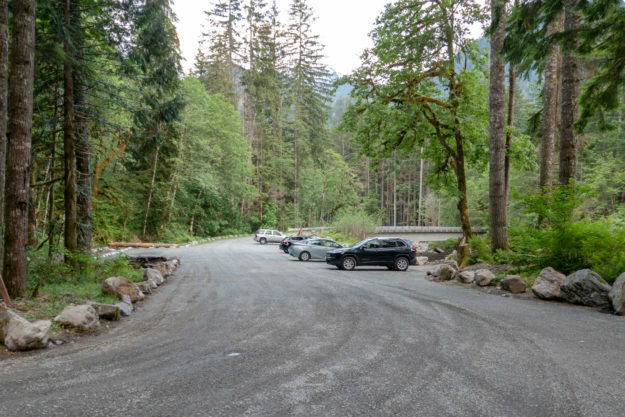 The Dingford junction area just beyond the Taylor River bridge has been a popular area for dispersed camping for many years. 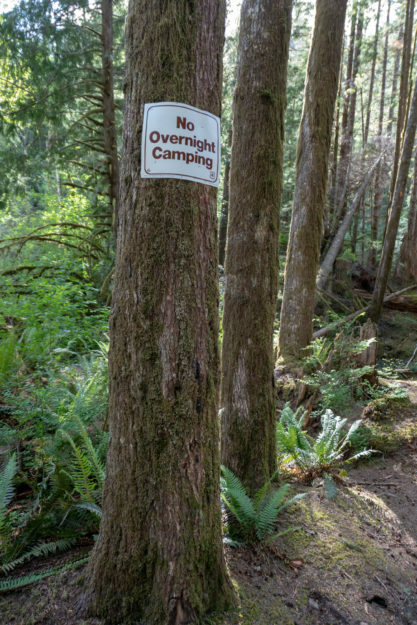 Camping is no longer allowed in this area. The completed project. 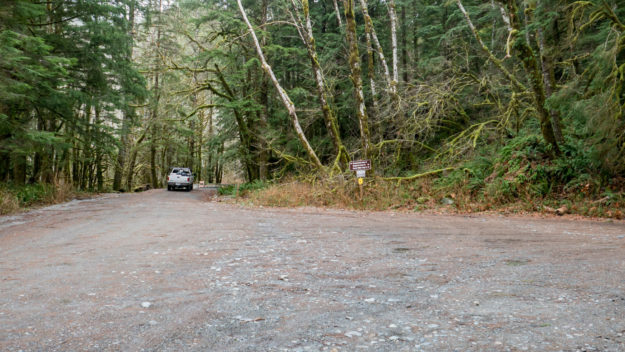 The Taylor trailhead road to the left is still blocked. The road to the right climbs Hell Hill on the way to the Dingford trailhead. 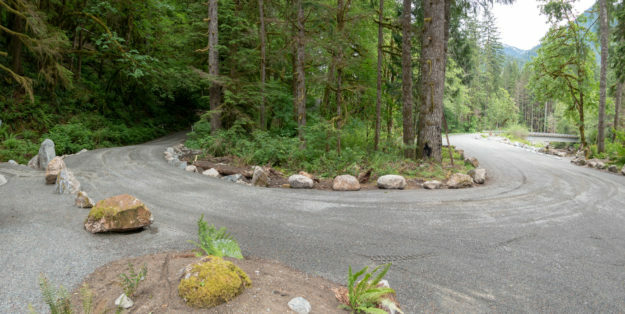 The turn in the road for climb up Hell Hill and after 6 miles of potholes, the Dingford trailhead. A new culvert was installed on the left to avoid persistent muddy ground in this area. 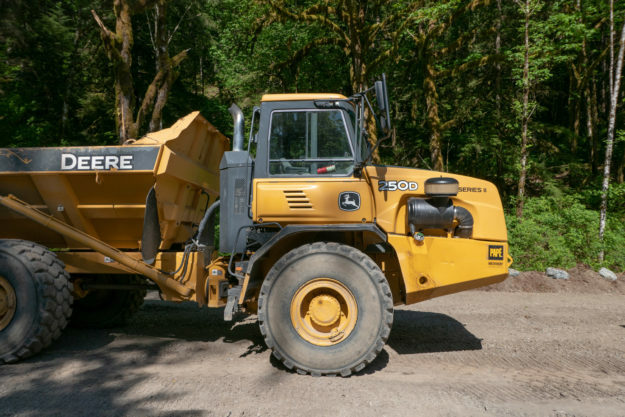 This entry was posted in Middle Fork Road, Taylor River and tagged road, toilet, trailhead, USFS on 2018/06/15 by mvanderbilt.